This Superior Shed was delivered and installed free of charge by our team of specialist installers as part of our end to end service. 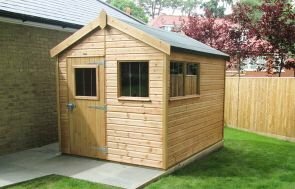 One of our range of garden sheds, this model features a pent roof and two partitions, allowing different uses within the same building. The exterior shiplap cladding was coated in our standard light oak preservative which protects the timber from fungi and woodworm as well as adding an attractive light stain. This was combined with heavy duty, torched-on roofing and guttering to harvest rainwater. The building also benefits from windows, allowing natural light to enter. 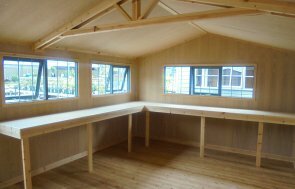 Each of our garden buildings are built at our factory HQ in Narford, Norfolk by our team of skilled carpenters. We are proud to use slow-growing FSC® certified timber sourced from our partner sawmill in Sweden. If you would like to discuss your own specific requirements, please request a callback, contact us directly or call us on 01760 444229 if you would prefer and one of our friendly team will be more than happy to talk through the options with you.